On April 2, 1940, Paul Cote was in his home on the 8700 block of Hollywood Blvd when a young man knocked on the front door. The young man was frantic. He pointed to a spot across the street where a body lay crumpled on the pavement. “Call an ambulance! A young woman’s been hurt.” Then the young man disappeared. Cole dialed the operator to summon emergency services and the police. The woman was taken to Hollywood Receiving Hospital where Dr. G.E. Christian pronounced her dead. She had perished from a skull fracture, broken neck and other injuries. The dead woman was identified as Pearl Wessel. Close on the heels of the first man’s visit to Cote’s home another young man, twenty year-old Alfred Dobriener of 1625 Sunset Plaza Drive, came to Cote’s door. He said that he’d been hiking in the hills above Franklin Avenue when he noticed an old car parked in an open space at the end of that street. From his vantage point, Alfred saw a man in the front seat and a man and a blond woman struggling in the back seat. Alfred thought quickly and took down the license plate number of the car–and that is when he ran over to Cote’s house to get help. The police kept the name of the car’s registered owner to themselves until they could locate him and bring him in for questioning. A third witness came forward. He said that he had seen a woman running down Franklin prior to Pearl’s fall. Was it Pearl? 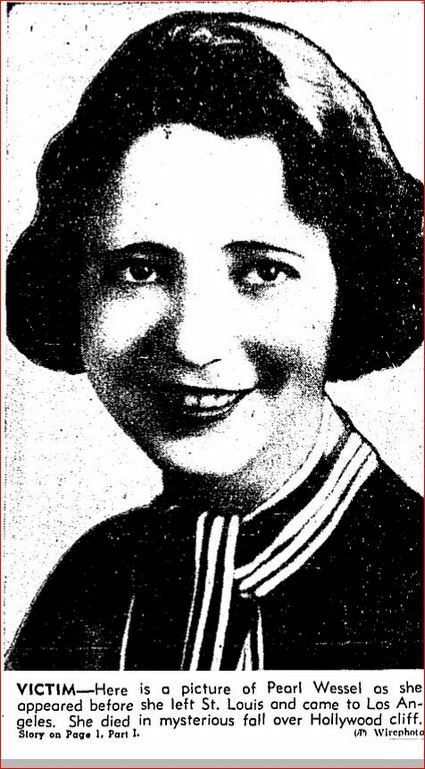 Pearl had been dividing her time between Los Angeles and St. Louis since 1928. Sh had gone to St. Louis to celebrate the New Year and then returned to Los Angeles shortly afterward and resumed her work as a stenographer. 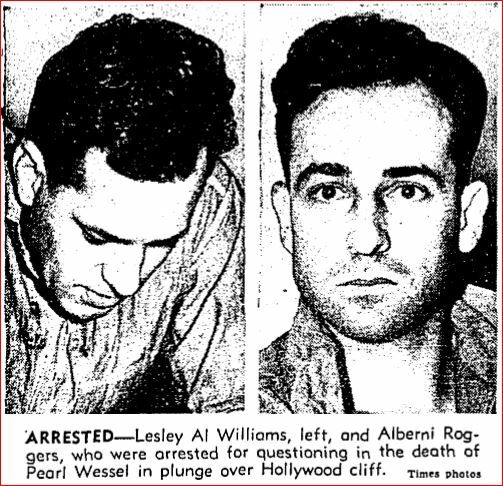 On April 4th, police had two men in custody for questioning in Pearl’s death; Lesley Al Williams and Alberni Roggers. Lesley, a self-proclaimed “mixologist” was the registered owner of the car and he was arrested at his home at 815 W. Sixth Street and booked on suspicion of murder. Lesley’s wife Daisy, from whom he appeared to be estranged, spoke to police from her home at 727 S. Olive Street. She told the police that Lesley was chummy with another bartender named Alberni Roggers. The police busted him at his home at 833 W. Ninth Street. Lesley and Alberni both denied having any connection with Pearl. At the death scene Police Chemist Ray Pinker found scuff marks consistent with the witnesses statements that Pearl had been dragged from the parked car before going over the cliff. Tire marks discovered at the scene matched the tires on Lesley’s car. 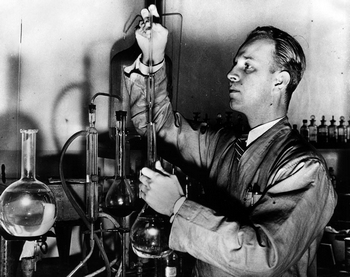 The evidence against the two men, particularly Lesley, was damning. Still, it was possible that police had arrested the wrong men. What if the witness had transposed or mistaken a number on the license plate of the car? NEXT TIME: Another suspect is identified as the investigation into Pearl’s murder continues.